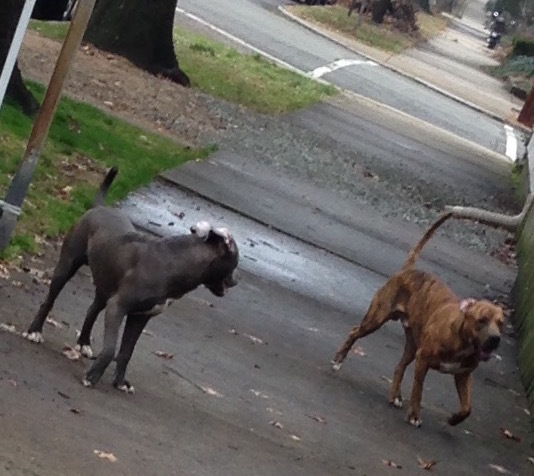 Know anything about these dogs? We unfortunately had to call Animal Control first thing because these pits were harassing people walking their dogs and jumping fences into back yards on the 300 block of Chimborazo. They seem friendly and just looking for attention, but they aren’t neutered, they don’t have collars and the blue one has a pretty nasty scrape on his nose. I thought I’d reach out to the network to see if anyone had any information on them. Let me know if you have any questions! Ummm – the tan dog is definitely NOT a pit bull and the dark one, while I cannot see his face to be sure, does not appear pit bull to me either. These are big lab mixes, NOT pit bulls. It makes NO difference if they are pit bulls or lab mixes or heinz 57. Was animal control able to get them off the street? The picture does no justice, but the pups were definitely pit mixes, one blue and one brindle. Really gorgeous and friendly dogs. Animal Control scooped them around 3:00 yesterday. Sorry – I’ve spent way too much time at animal control lately, where 8 out of 10 homeless dogs are pit bulls. Having 2 pit bulls myself, I get frustrated that every big blocky loose dog is described as a pit bull. I could go with pit mixes maybe. Glad these guys are off the street and I hope they get claimed or get homes. i saw a man walking these dogs on 23rd street just yesterday. someone does own them. an older gentleman. so im guessing he claimed them after animal control go them.